Life's been busy with job from hell, world travels and remodeling. I'll provide more details on that later. I've reorganized my sewing spaces and now I'm ready to get some sewing done. 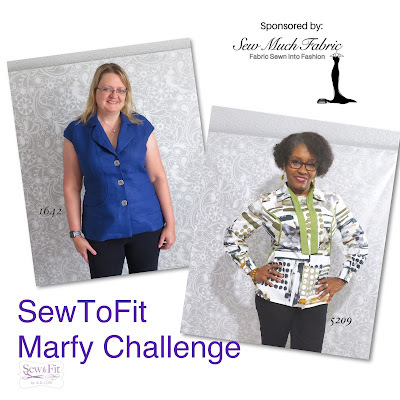 I'm back to sewing due in large part to challenges from SewToFit. The first Saturday of each month we are live on YouTube to reveal and discuss our Marfy make from the previous month as well as have a live poll to chose the patterns for the next month. 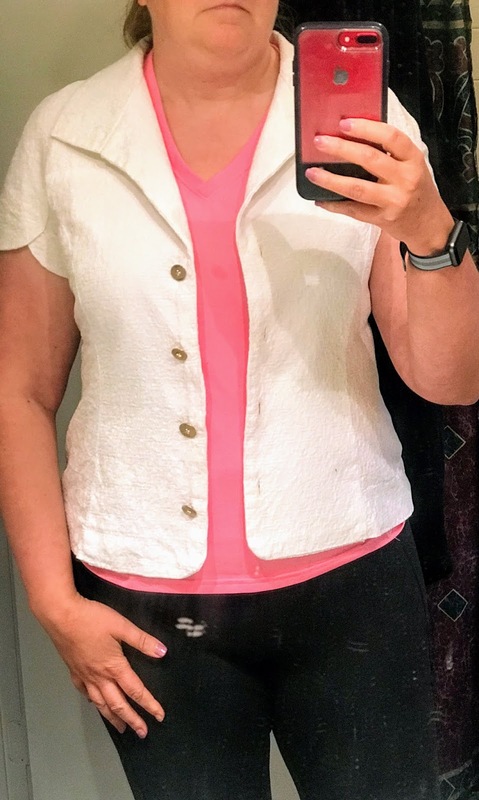 I also snuck in a little fit help from Ms Sew To Fit, Andrea is my Fit Goddess! She did the fit for my jeans pattern so she's the one I go to for perfection. 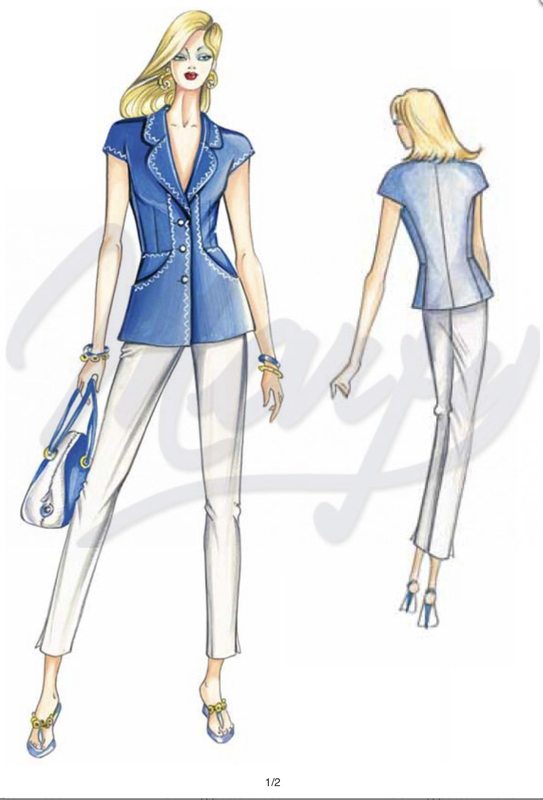 The challenge for February was blouses so we picked this super versatile blouse from 2008. I like the versatility of this blouse from dressy casual to professional and perfect for Houston's climate. 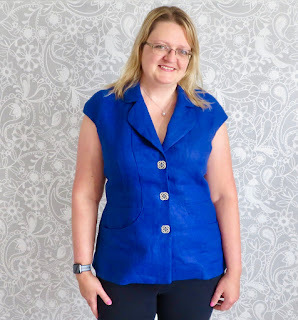 This pattern is available on the Marfy website here in sizes 42, 44, and 46. I ordered a 46. 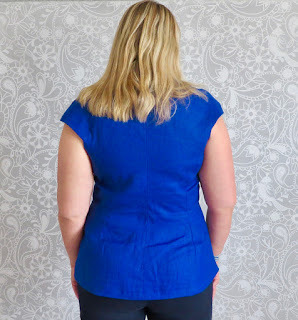 I started my fitting process by comparing the fit to another favorite, similar silhouette Marfy 2762 blogged here. Currently its about 2" too small. I lay the pieces for 1642 on the old jacket and matched the seams and confirmed the sizing, I decided to add an inch to the length above the waist. You can see from the layout of the pattern below how well the details match the pattern sketch provided. The lines of the waist seam and the upper and lower side front and back. I planned my construction steps and made sure to mark the pattern number and size on each pattern piece (they don't come with these marked). The gorgeous lapis fashion fabric is 100% linen from Sew Much Fabric. Its described as dress/jacket weight and she has it in ta wide range of vibrant colors that are perfect for the transition to spring. 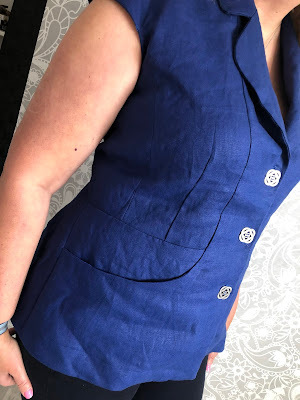 The jacket is unlined and the seams serged for time. I could've done a Hong Kong finish, but in cleaning my sewing room out I found so many, MANY projects 90% done that I out grew before finishing and I'm really in the mod to get stuff done and wear it! I used fusible weft from Fashion Sewing Supply on the under collar and front facing. I usually use fusible interfacing on the entire body of a linen jacket, but I think this is crisp enough to wear well without it or lining. I love this pattern, the matching points are well marked and the construction is much more simple than it looks. 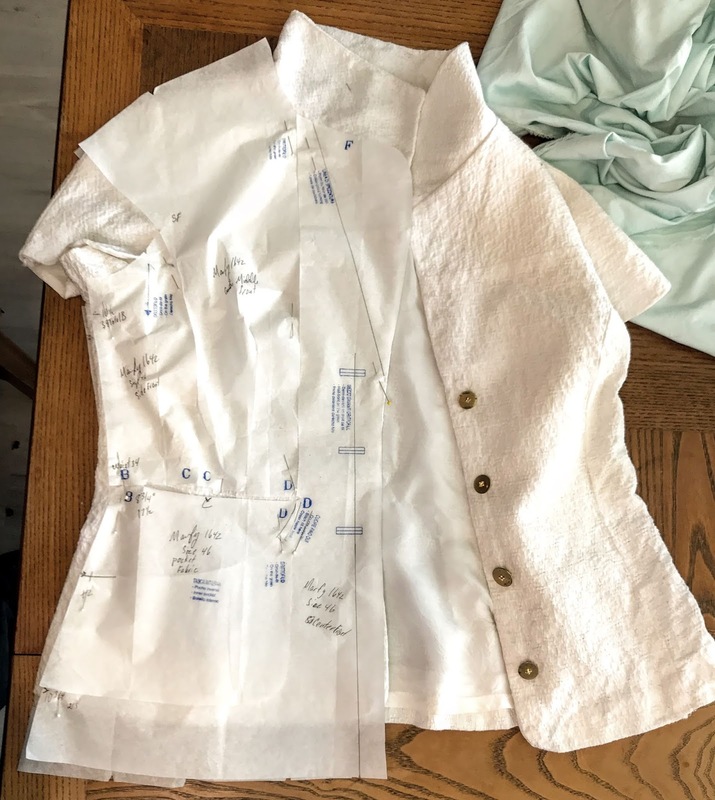 Basically you sew the side tops together with their side bottoms, then join them with the center front and center back pieces. 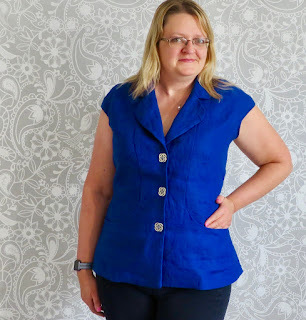 Even the center front easily sews straight down to that pocket lining making the perfect fabulous pocket. I cut the upper collar on the bias without noticing that the instructions stamped on the pattern. I'm an absent minded rebel like that. I can't wait to sew this again. I want to do it in a proper suiting fabric with the topstitching trim. Next month its jackets and the viewers chose 5062, so more on that next post. 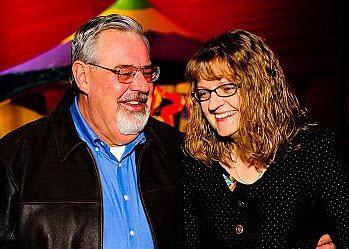 My dear husband of 22 years and 51 weeks passed away on Friday. He went to the hospital for an angiogram on May 23, had a quadruple bypass less than 24 hours later. The bypass was successful, his heart was recovering. He had been a heavy smoker for 50 years and his lungs never recovered. They found 2 spots, one on the outside of his lungs was an infection. The one on the inside of his lungs was biopsied 3 weeks later and found to be malignant. His lungs wouldn't function and he had been in a chemically induced coma for almost 3 weeks. On June 17th, his heart gave out and he passed away. 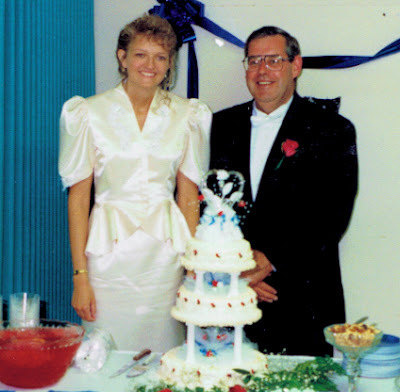 After 22 years and 51 weeks of marriage to a smoker, I have some observations for those who love someone who smokes. You can't nag them into stopping. Don't marry someone thinking you will change them. You will simply change them into your EX. If you fight it, you will not win. The dependent relationship with cigarettes is longer and more ingrained than the relationship with you. They won't want to exercise, this increases the chances of diabetes and heart disease. Brace yourself for a long fight if anything else goes wrong. They might not die of lung cancer. But, it makes EVERYTHING else that goes wrong with their body more difficult. Control the second hand smoke. If they smoke in the house keep your clothes and fabric covered. I was once warned of this by a recruiter when looking for work. Find the good hospital you're probably going to need it. Smoking increases your odds of many, many diseases including several cancers like bladder, throat and mouth cancer as well as circulatory problems and heart problems. Get to know nurses, they are wonderful people and the good ones have more influence over the Dr's than you would think. They will also talk to you straight and share more information. The things that modern medicine can do for the heart are amazing! They can crack your chest open and redo the entrance ramps, replace the valves and even replace it with a little mechanical heart. The options for lungs are limited. The tissue is special and can not be replaced once it is destroyed. It absorbs stuff in the air around you and sends it right into your body so take care what you put in your lungs. That being said, I do not regret going along for the ride. I loved him so much. He was such a smart man who always chose to do right and being with him taught me so much. He sharpened my sense of humor and challenged me to grow and become what I am today. He supported me when I was weak, laughed and cried with me. He had been taken off of the sedatives, pain killers and paralytics after almost three weeks. He couldn't talk with the tracheostomy and respirator, but his face was expressive. The first things to come to life were his eyebrows and he could speak volumes without making a sound. He interacted with me Friday morning. I told him about my job and my day, he was so happy to hear from me and I knew that he loved me. Two hours later I got the phone call at the office that he was in cardiac arrest. When I got to the hospital the doctor explained they weren't able to revive him and the lab tests were positive for cancer. I don't know if he would have made it through cancer treatments, but it would have been excruciating. He got to go on a high note, still working, still loved and still choosing and that would have been his preference. If you are willing to wrap your heart around someone, you have to love strong enough to let them make their own decisions. You have to be able to accept letting go.